The first cool breeze, the smell of a pumpkin spice latte, a few falling leaves — fall has finally arrived. As the summer months come to an end, and we transition from our summer salads to butternut squash soup, it’s time to think about a different flavour palette — one that embraces the new season and gets us excited for the cooler, crisper months ahead. When you think of fall fare, you may imagine Thanksgiving turkey smothered in gravy, steaming apple pie and other comfort foods. However, there are plenty of better-for-you options to choose from. Here are a few of our favourite fall foods for weight loss that will keep you on track ahead of the fall and holiday season. Apples get all the glory when it comes to fall, but what about their sweet, juicy cousin, the pear? Pectin is a soluble fibre that helps us feel full, and pears have it in spades. They’re in peak season during the months of September through November and make for great snacks. Slice one up with cottage cheese for a yummy breakfast that clocks in at less than 200 calories, or bake them in the oven with cinnamon and brown sugar for a tasty treat that won’t break your diet. Hooray for pumpkin season! There’s a reason why “pumpkin spice” is so damn popular. We love the taste, the smell and the warm cozy feelings all things pumpkin, but don’t forget about the tasty seeds. Roast them with a dash of sea salt and eat them as a snack, or sprinkle them over a salad for some extra protein (as well as magnesium and zinc!) in a pinch. Add some colour to your plate with beautiful, red beets. Beets contain beta lain which is a phytonutrient compound that naturally enhances our bodies’ own detoxification process. When toxins are properly eliminated from our bodies, we metabolize food much more efficiently. Beets are one of the best foods for weight loss! Did you know that broccoli is over 90 per cent water? Water-dense foods are great for maintaining our figures, because they keep us feeling full. Aside from Broccoli is oh-so versatile; it can be steamed or roasted with a bit of garlic salt and olive oil for a delicious autumn snack or side dish. Pomegranates are one of many superfoods, mainly because of their incredibly high vitamin C content, which helps fight seasonal colds. 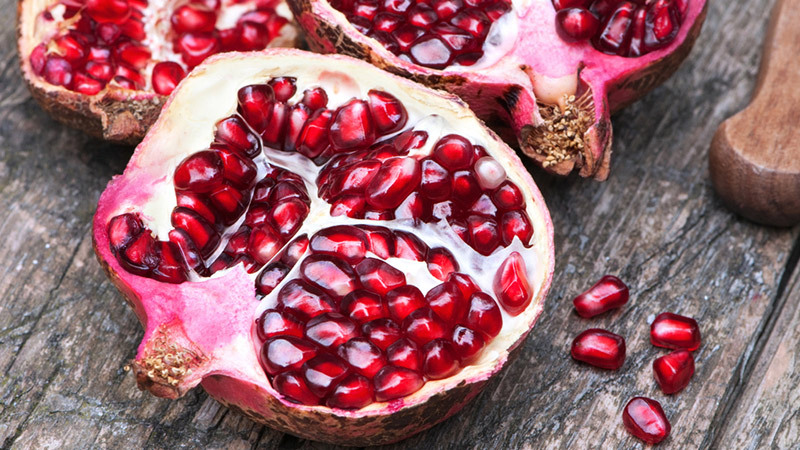 Pomegranate seeds are called arils, and have a sweet, tangy taste and are highly nutritious. Try adding low-fat Greek yogurt or almond milk to pomegranate for a delicious smoothie or toss some in the juicer for a colorful and tasty meal in a glass. Yes, sweet potatoes are sweet, but don’t let that scare you. 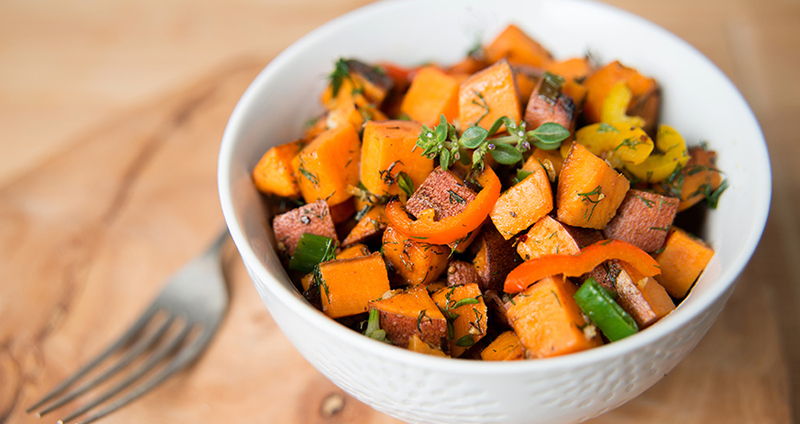 The starch in sweet potatoes is a “resistant starch,” which can actually help with fat burning. (Some people argue that sweet potato is healthier for you than white potatoes, but the verdict is still out.) They’re a non-processed, non-refined carbohydrate, making for an excellent side dish to keep you feeling full. Not only that, but the natural sweetness of these potatoes can replace dishes made with white or refined sugars ,which you want to avoid if you are trying to lose weight. Bake a dish of sweet potatoes sprinkled with cinnamon and top with low-fat vanilla yogurt for a dessert alternative that will satisfy that sweet tooth. 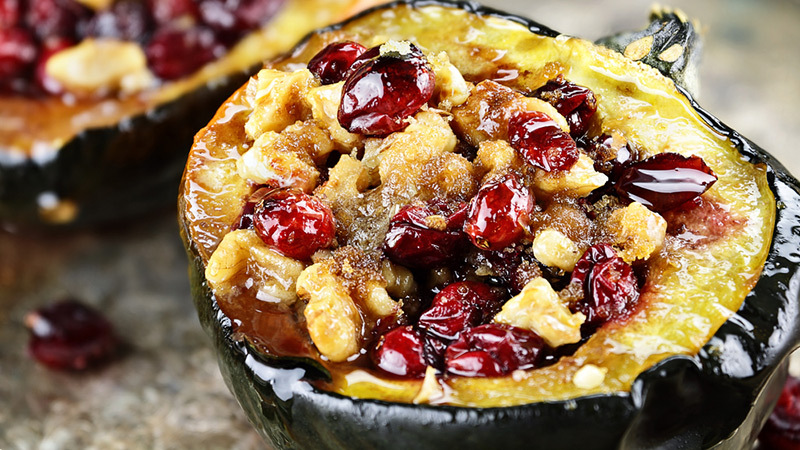 With just 55 calories per cup, acorn squash is delicious, comforting, and unbelievably beautiful when presented in the right way. Stuff them with ground lean turkey or beef, or quinoa and veggies, and roast them in the oven for stunning, Pinterest-inspired dish that will impress your guests. (We recommend adding a dash of cinnamon for that extra autumn feel, but rosemary also goes great with this sweet, nutty gourd.) Not only is acorn squash the perfect comfort food, it’s extremely nutritious, with tons of potassium, vitamin C and fibre. There’s no shortage of fall foods for weight loss, and these are just a select few. And don’t forget, autumn is also the perfect season to enjoy a hike in the great outdoors and enjoy the beautiful fall foliage.